This targeted mutation strain carries a replacement of the mouse Nr1i2 and Nr1i3 genes which encode for the nuclear receptors PXR and CAR with the corresponding human orthologous genes. Useful in prediction of CYP induction and therefore pharmacokinetics, drug toxicity, and efficacy in man. 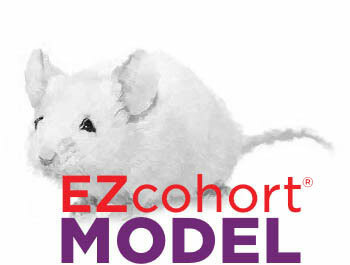 Model has relevance for the prediction of the hazard of non-genotoxic rodent liver growth carcinogens to humans. The Humanized PXR-CAR Mouse was developed by Taconic in collaboration with CXR Biosciences. The Humanized PXR Mouse model was created through a knock in of a human PXR cDNA/genomic construct onto the ATG of murine Pxr in C57BL/6NTac-derived ES cells. The human PXR sequence that was introduced contains a cDNA fusion of exon 2-4, intron 4, exon 5, intron 5, exon 6, intron 6, exon 7, intron 7, and cDNA fusion exon 8+9. The Humanized CAR Mouse model was created through a knock in of a human CAR construct containing the genomic sequence from the translational start site on exon 2 to exon 9 onto the ATG of murine CAR in C57BL/6NTac-derived ES cells. The expression of the human PXR and CAR receptors is driven by the corresponding mouse promoters. In both cases targeted ES cells were injected into BALB/cJBomTac blastocysts and the resultant chimeras were backcrossed to a Flpe deleter strain on C57BL/6J to eliminate selection markers. The Humanized PXR-CAR Mouse line was obtained by crossing the two single humanized mouse lines. Taconic received stock in 2008, and the line was embryo transfer derived. The colony was maintained by mating double homozygotes. Note: This publication describes only the humanized CAR modification. An improved PXR humanized model was created subsequent to this publication which was used to create the present Humanized PXR-CAR Mouse model (Scheer, et al., 2010). Scheer N, Ross J, Kapelyukh Y, Rode A, Wolf CR. (2010). In vivo responses of the human and murine pregnane X receptor to dexamethasone in mice. Drug Metab Disp 38(7) 1046-1053. Ross J, Plummer SM, Rode A, Scheer N, Bower CC, Vogel O, Henderson CJ, Wolf CR, Elcombe CR. (2010). Human constitutive androstane receptor (CAR) and pregnane X receptor (PXR) support the hypertrophic but not the hyperplastic response to the murine non-genotoxic hepatocarcinogens phenobarbital and chlordane in vivo. Toxicol Sci 116(2):452-66. Braeuning A, Gavrilov A, Brown S, Wolf CR, Henderson CJ, Schwarz M. Phenobarbital-Mediated Tumor Promotion in Transgenic Mice with Humanized CAR and PXR. Toxicol Sci. 2014 May 25. Human constitutive androstane receptor (CAR) and pregnane X receptor (PXR) support the hypertrophic but not the hyperplastic response to the murine nongenotoxic hepatocarcinogens phenobarbital and chlordane in vivo.